The stunning “Legend of Zelda HD Experience” demo Nintendo showed at E3 got many of us (including myself) drooling at the possibility of seeing the masterful gameplay of the Zelda series finally combine with some high-caliber hardware. However, Nintendo made it very clear that it was only a demo, and not necessarily a real game in development. Today, Miyamoto confirmed that there really will be an HD Zelda game on the Wii U. Was it inevitable? Of course – but that doesn’t make it any less exciting. 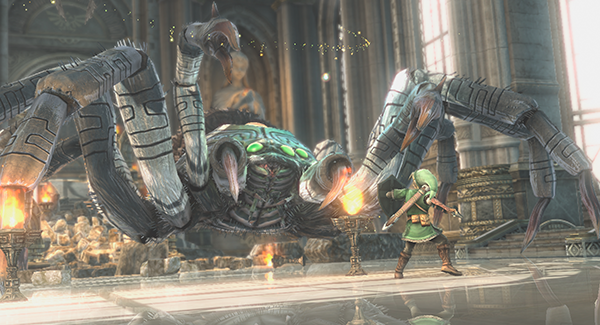 This is an HD system, our first HD system, and we want to create a real HD Zelda game for it. You will see a lot of these in-depth and deep experiences in terms of visual style. You will also see some play styles that are fun and interesting because of the play structure. So there you have it. Miyamoto didn’t specifically talk about whether their Zelda game for the Wii U would be made in a realistic (Twilight Princess), cel-shaded (Wind Waker), or impressionistic (Skyward Sword) style, but I’d put my money on realistic, seeing just how good the Wii U can make it look. There’s a picture somewhere on the internet that shows how all the zelda tech demos for a console have looked considerably worse than the actual game. If that’s considerably worse… I can’t wait. You think abou that one? I made it some time ago. You know, reading the full interview to me it doesn’t really seem like he did confirm it. He could just be referring to the HD experience. Not that it matters because we all know were going to get an HD Zelda at some point, we just don’t know when. Maybe this games story could take place some time after Midna shattered the Mirror of Twilight? Ok, maybe no……but who else wonders what happens after that? Like, does she meet Link again ever or is that just it? Regardless, this game will prove interesting no matter what story they make for it. There is no specific information being about this new game except for the fact that it will be a continuation of the previous game with Nintendos next generation platform..This years instalment is actually the sixteenth instalment of this game. It is confirmed that this new version utilizes Wii Motion Plus peripheral for sword fighting and archery both for staples and series.